In spite of all the things smartphones can do, messaging remains one of the most popular activities. Popular messaging apps like WhatsApp, Viber, WeChat support text messages, voice calls, photo & video sharing features, but there is no provision for sharing every file types on these amazing messengers. But, some or the other day, we all got struck into an awkward situation where we have to share PDF, apk or zip files with our friends while chatting. However using any other 3rd-party file sharing services, we can share image, video, audio, zip files or any other file type with our friends, but it would be a lengthy process and sometimes require to use computer. Gone are the days when you relied on your computer to get all of your work done. Telegram Messenger, the most popular and ultra secure messaging application, is now offering file sharing feature that allows its users to share large files and documents (up to 1.5GB) securely. Telegram is a messaging app that offers end-to-end encryption and also offers a 'Secret Chat' feature, that self-destruct messages after the conversation. The notable thing about Telegram Messenger is that it is free and an open source project, which means that the source code of the project is freely available. "A huge advantage of Telegram over any other tool is sharing large documents," the company wrote on its blog post Sunday. 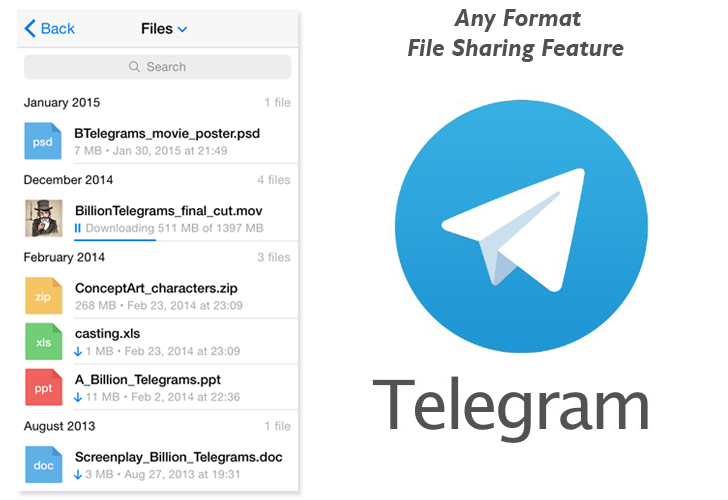 "You can send files up to 1.5 GB using Telegram and access them from any of your devices. Perfect for everything from studying to sharing personal archives." This means that now any file we receive in Telegram Messenger can be sent to email or any other apps just by opening the file in the app and tapping on the Share button. Moreover, Android users would be given a 'Share' option in the file's context menu that will help them to share large files with their friends. This is rather a very handy feature that many Telegram Messenger users might find useful, since most email providers limit the size of files attachment to 25MB. Also, interesting since none of the competitive service — WhatsApp, Viber, Line allow the transfer of non-media files only. Telegram Messenger is offering, what the company calls, Bonus for iOS users. As the app is now supported in the iOS 8 sharing menu that could be open while users are viewing any document on their iOS devices. In addition to sharing large files, the new Telegram Messenger update offers Mute Notifications, where users can temporarily mute notifications from particular contacts and groups for 1 hour, 8 hours or 2 days; and Multisearch, where users can get instant results for particular contacts, chats, groups, usernames or messages. Download Telegram Messenger for Android and iOS. Cryptocat developer's Peerio secure messaging app also offers file sharing, but the app is not widely used by people, as it is available only for Windows, Mac OS X and Chrome, but not for Android and iOS platform. Android and iOS version of apps are in the progress and will be available soon. Peerio is an "encrypted productivity suite" designed to offer much more usable alternative to PGP email and file encryption, so that every individual user and business can encrypt everything from Instant Messages to online file storage.